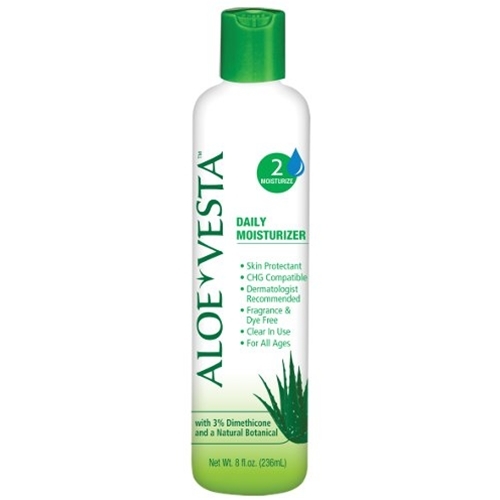 ConvaTec Aloe Vesta Daily Moisturizer from HealthyKin.com is excellent for routine moisturizing and skin protection. It was formulated with the needs of people with sensitive skin in mind. It leaves the skin feeling smooth and soft and helps to relieve dry skin. Helps protect and prevent chafed, chapped and cracked skin. I love this product! I am diabetic and suffer from autoimmune disease(s)...my skin is like sand paper. I get amazing relief with this lotion! My whole family loves it! I purchased 12 bottles of the 8oz bottles and 2 bottles of 2oz (easier to carry in purse), will be reordering again, and again, again! Very soothing on intact skin. However, it has cetyl alcohol in it and is not good on open, raw skin. I learned that the hard way. Wonderful product for face, too. Great product. Hospital Quality! I have and will order again. Better than Jergens. Excellent product it really helps where others didn't . Thank you , for a great product. Great product. Everyone should use it.